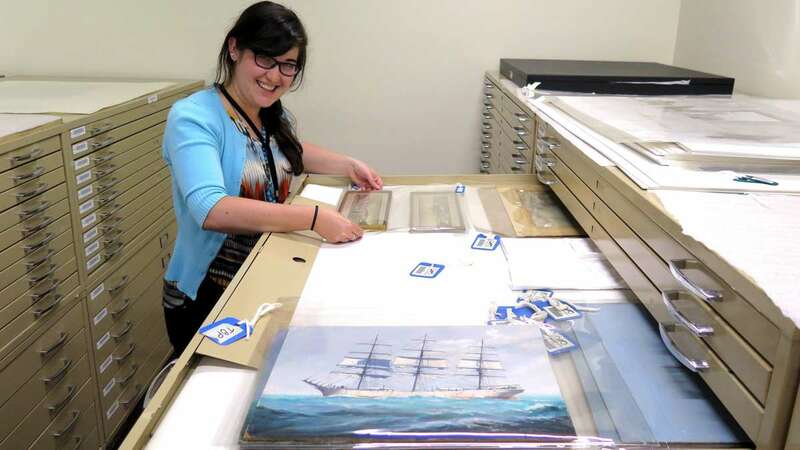 Lucilla Ronai is the Paper Conservator at the Museum. She ensures the many books in the collection are physically and chemically stable. 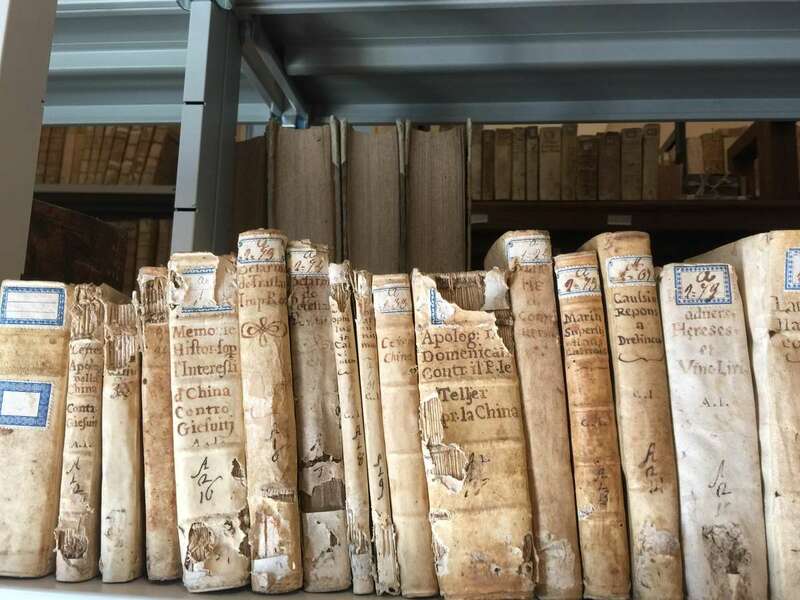 A Paper Conservator also considers the condition of collection items, methods of display during exhibition and loan as well as their safe storage when not in use. Image: Kate Pentecost/ANMM. Our collection includes over 2,000 bound volumes. This ranges from printed books (such as dictionaries), manuscripts (such as logbooks, journals, diaries and sketchbooks), atlases and magazines. The earliest book is an account of the first journey of the Dutch to the East Indes and dates from 1617. The most recently printed book is the Year Book of HMAS Toowoomba, from 2009. What are the main differences between these books you ask? 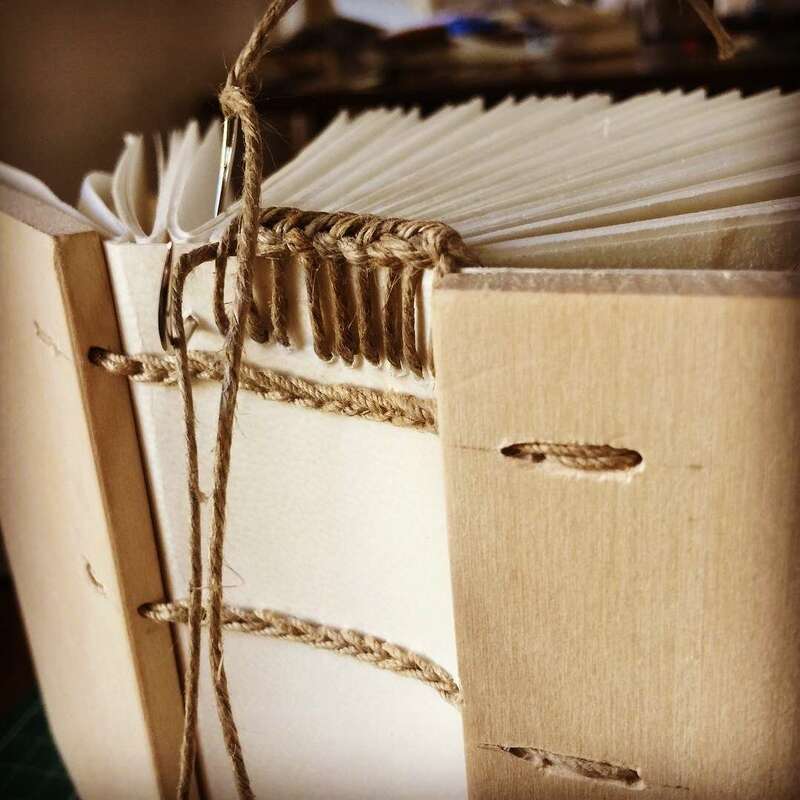 The materials and techniques used to string words, images, paper and covers together to create the functional item you know and handle as a book. The Museums collection includes paper-based objects such books, journals, paintings, photographic material and much much more…all of which Lucilla Ronai works to conserve. Image: Conservation/ANMM. 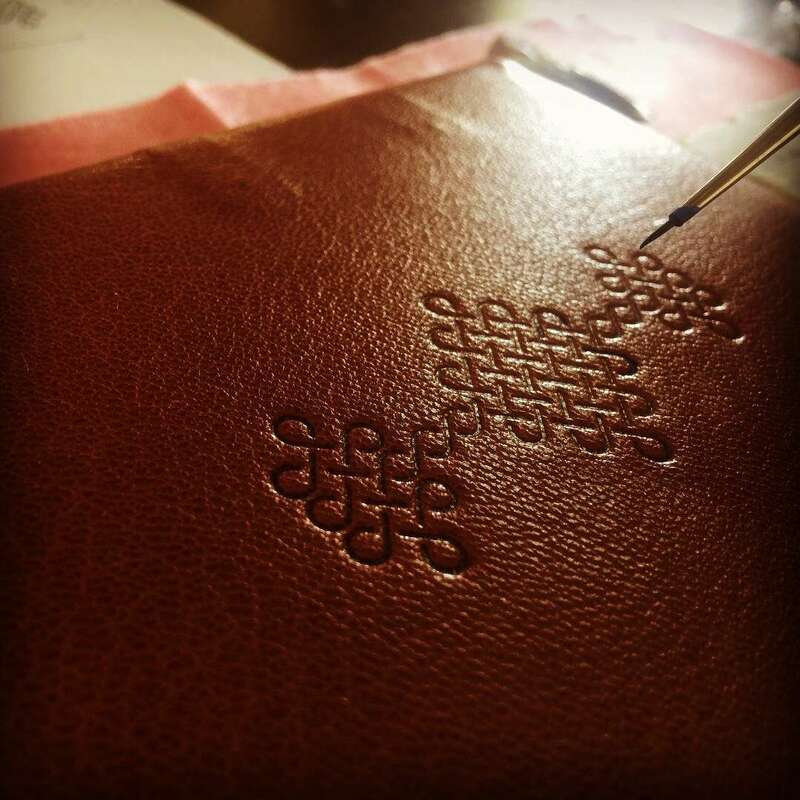 Materials and techniques provide a fascinating insight into the culture or bookbinder that created the item. 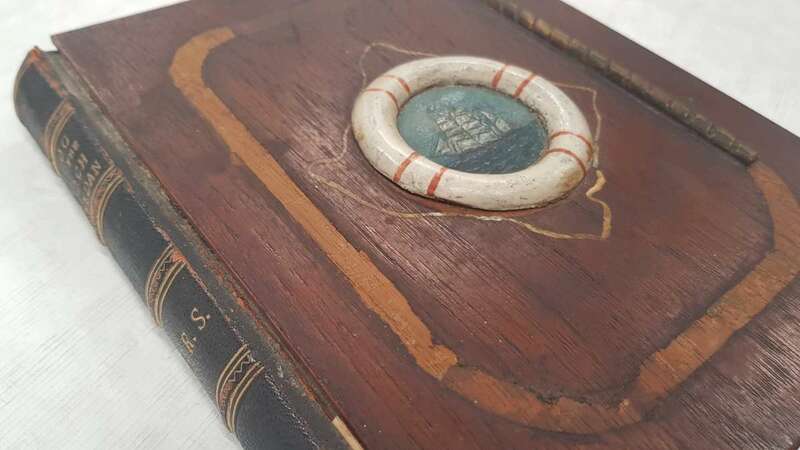 These elements also leave important clues for how to care for each item, to ensure the beauty and knowledge contained within the book are not lost to the ravages of time. This is where the conservators come in! I become a Paper Conservator as I love old things, working with my hands, utilising scientific techniques and couldn’t believe there was a job out there that let me literally have a hand in preserving history. It is a privilege to look after paper items (such as maps and letters penned to loved ones). I also work with the three dimensional, bound and functional items in the collection known as ‘books’. 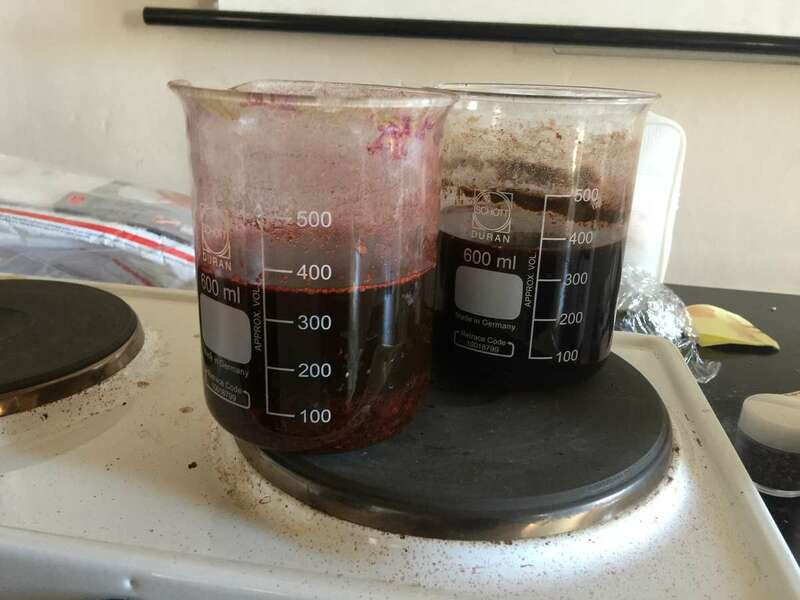 Looking after these items involves ensuring they are physically and chemically stable. 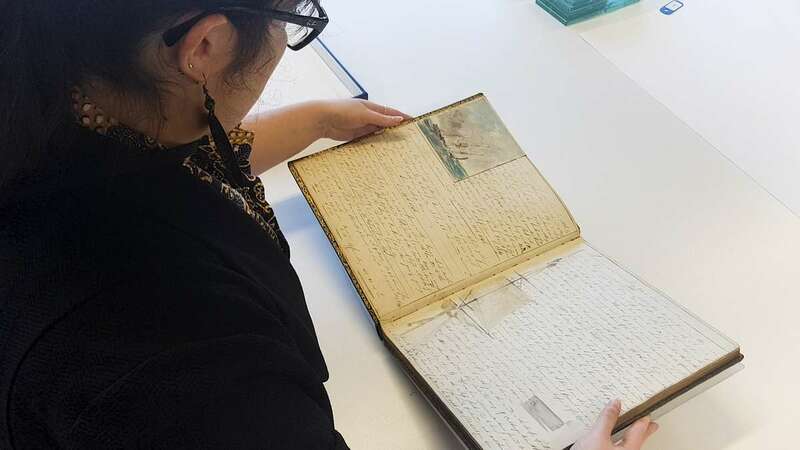 A Paper Conservator also considers the condition of collection items, methods of display during exhibition and loan as well as their safe storage when not in use. Most people know that a book is made up of pages, covers and a spine. 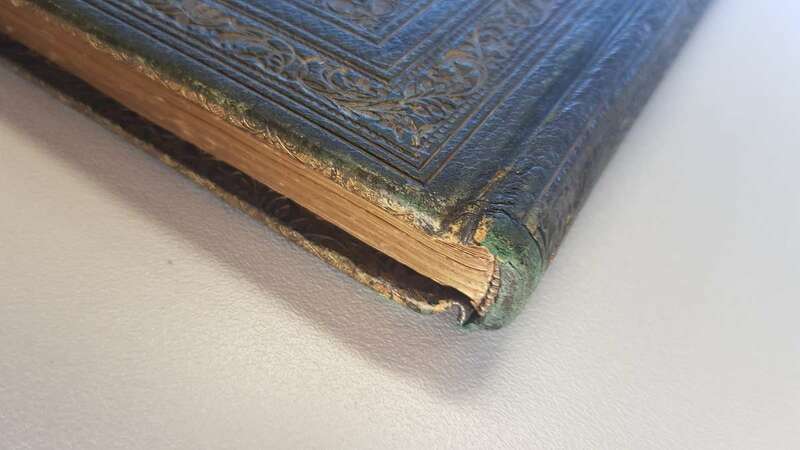 But did you know that the edge of the pages directly opposite the spine is the foredge? 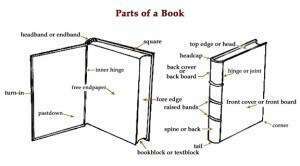 Parts of a book. Image: Thad McIlroy. 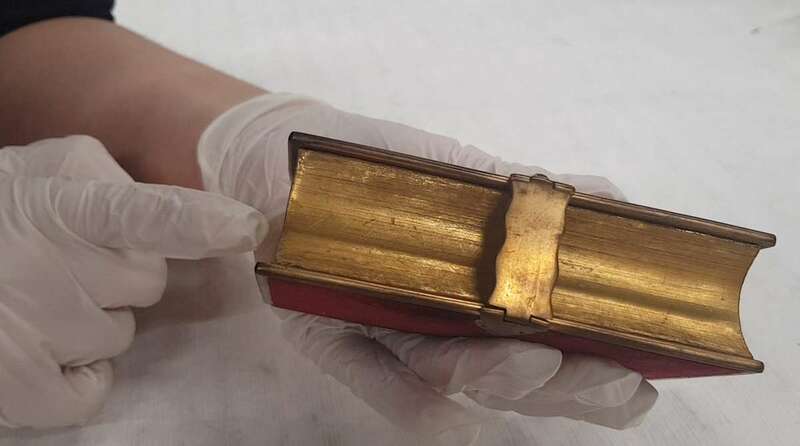 The foredge can be gilt with gold, speckled with colour for decoration, burned with ownership marks or even contain hidden painted images depending on the way you hold the book. 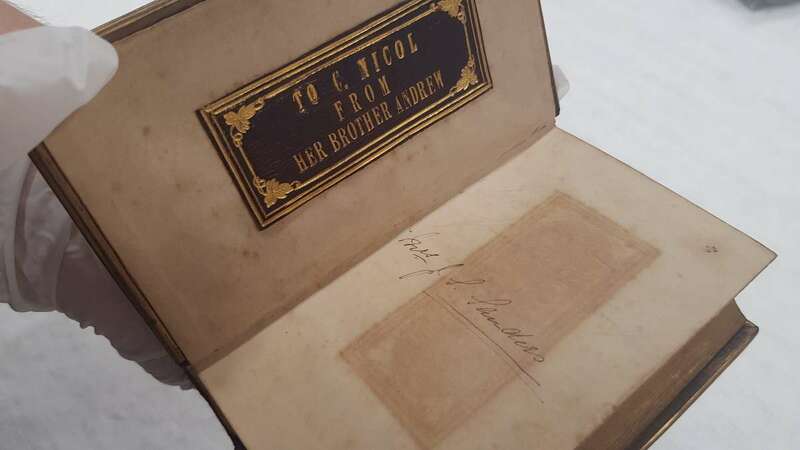 While these details are intriguing, they also provide information to where and when the book was made and how it has been treated and valued throughout its life. The foredge of this small bible is gilt with gold and features a concave design. ANMM Collection 00054909. Books come in all forms, shapes, sizes and materials. They range from pocket-sized dictionaries to large atlases graced with detailed charts. 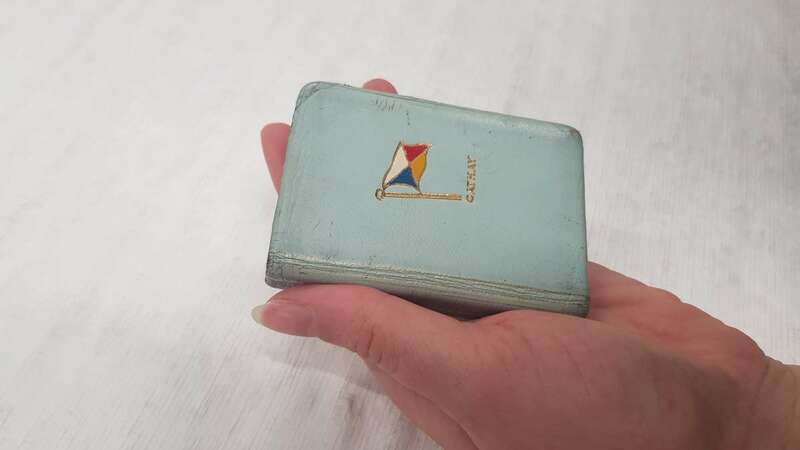 One of the smaller books in our collection is a midget English dictionary from P&O Line SS CATHAY. ANMM Collection 00004563. 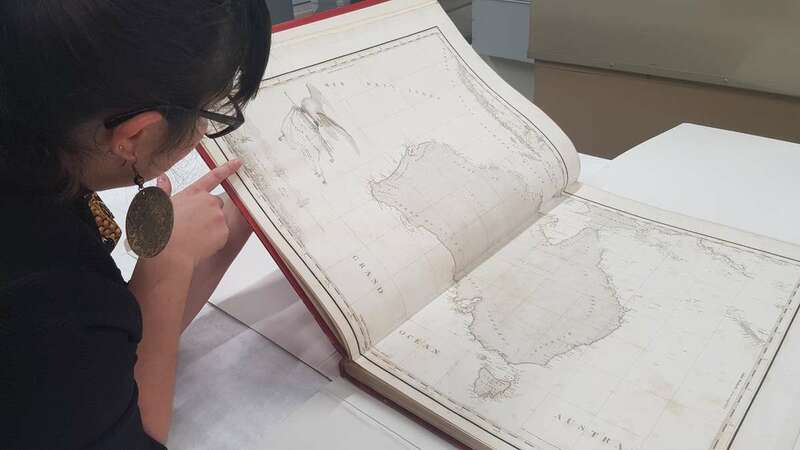 An atlas featuring early maps of Australia is an example of larger books in the collection. ANMM Collection 00050333. 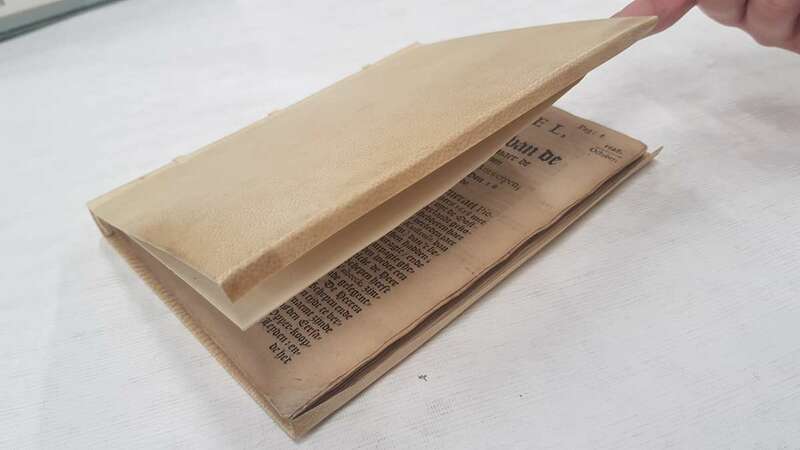 We have books covered in vellum, which is animal skin (usually from a calf) that has been prepared to cover a book. 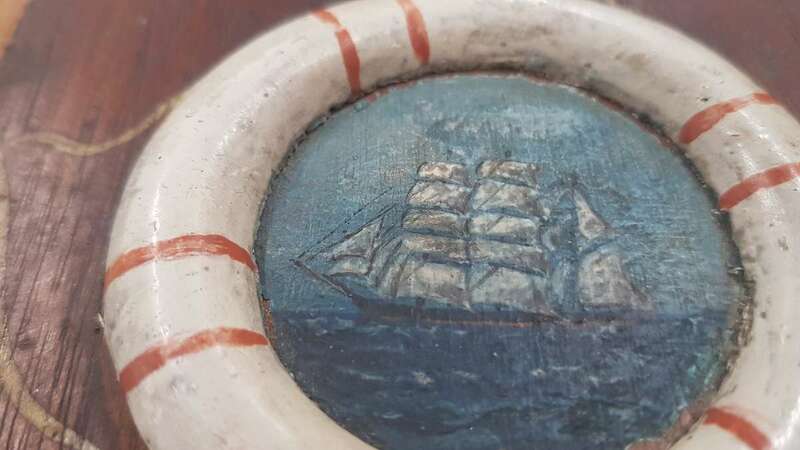 Ongeluckige voyagie, van’t schip Batavia, nae de oost-indien covered in vellum. The book covers three separate expeditions by the VOC and included gruesome details surrounding the wreck of the Batavia on a reef off West Australia. Vellum can also be written on and is often used for pages as well. A vellum covered book from the 17th century. ANMM Collection 00006056. Hand sewn endband. ANMM Collection 00006056. Textiles can be used for book covers. Metal clasps or decorative details embellish some tomes. 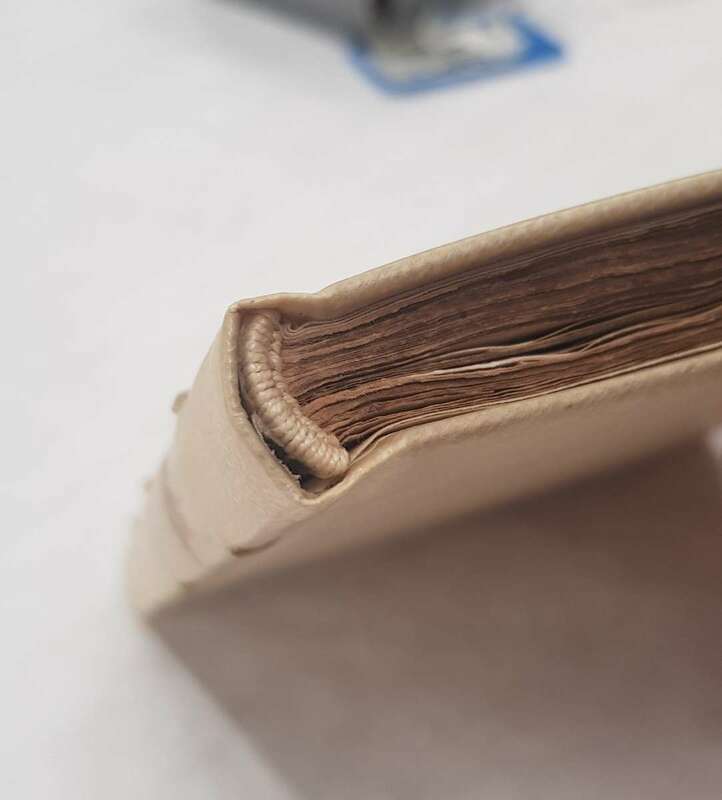 Thread is used to stitch the pages together or create the endbands on the top and bottom of a book near the spine. 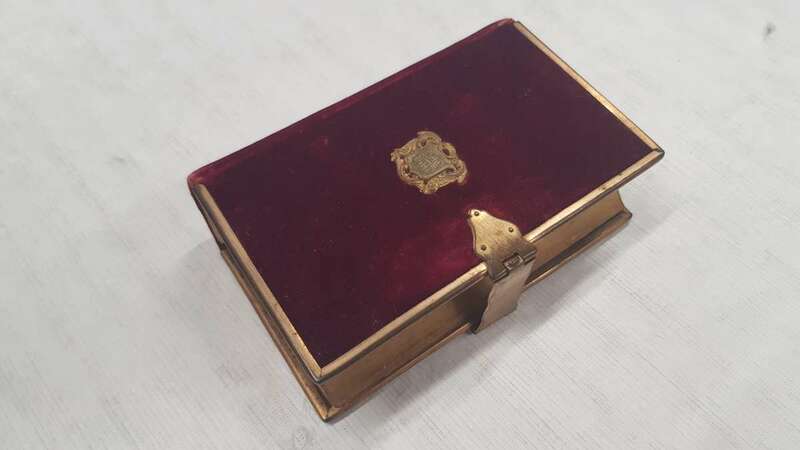 The rich velvet cover and metal clasp indicate that this was a treasured gift. ANMM Collection 00054909. 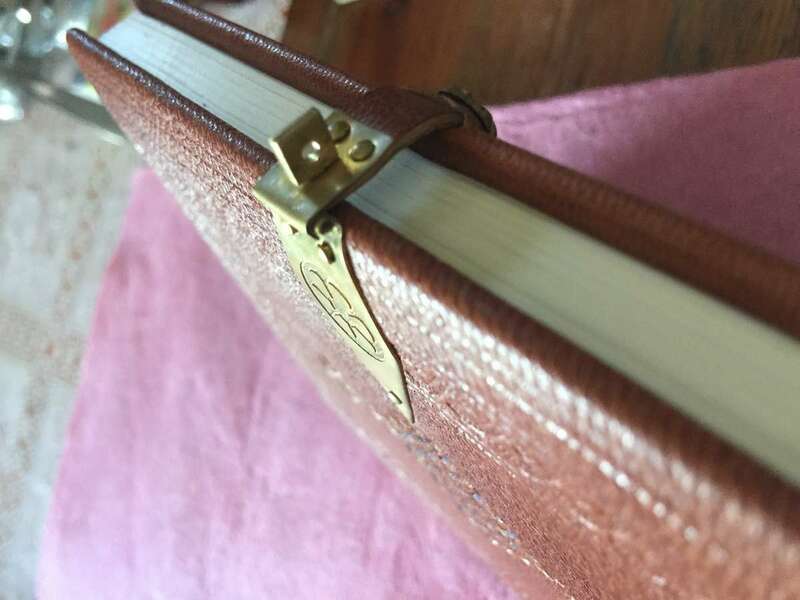 The leather and gilt label on the frontpage has stained the opposite page. ANMM Collection 00054909. Lucilla Ronai gently opens the hand illustrated log from the whaling barque Terror on its custom display support. ANMM Collection 00038301. A detailed look at the fine gilt foredge and hand sewn endband of the hand illustrated log from the whaling barque Terror. ANMM Collection 00038301. 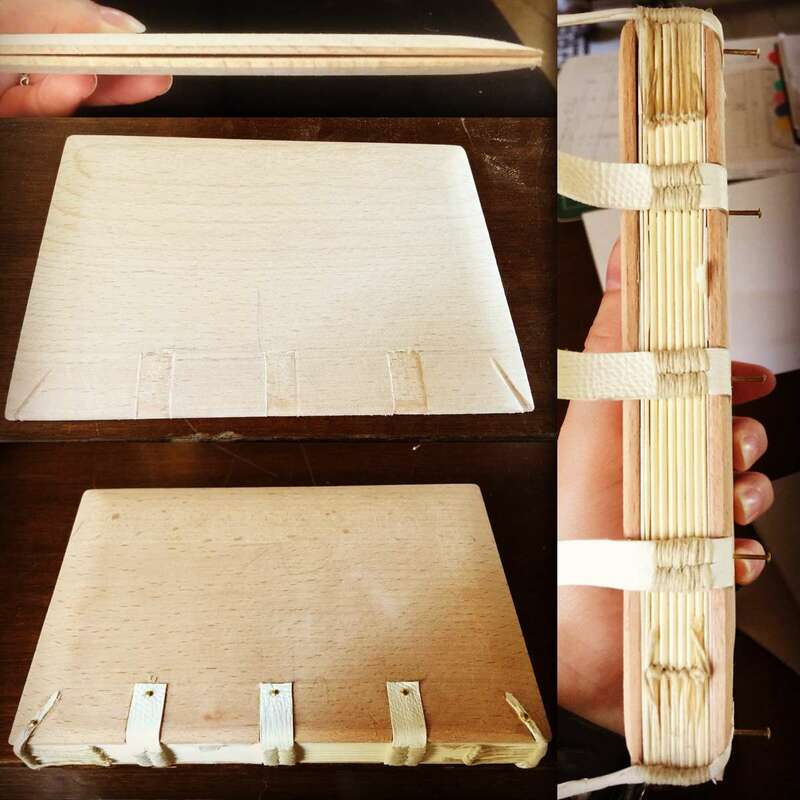 Wooden covers create a sturdy base to protect the pages. 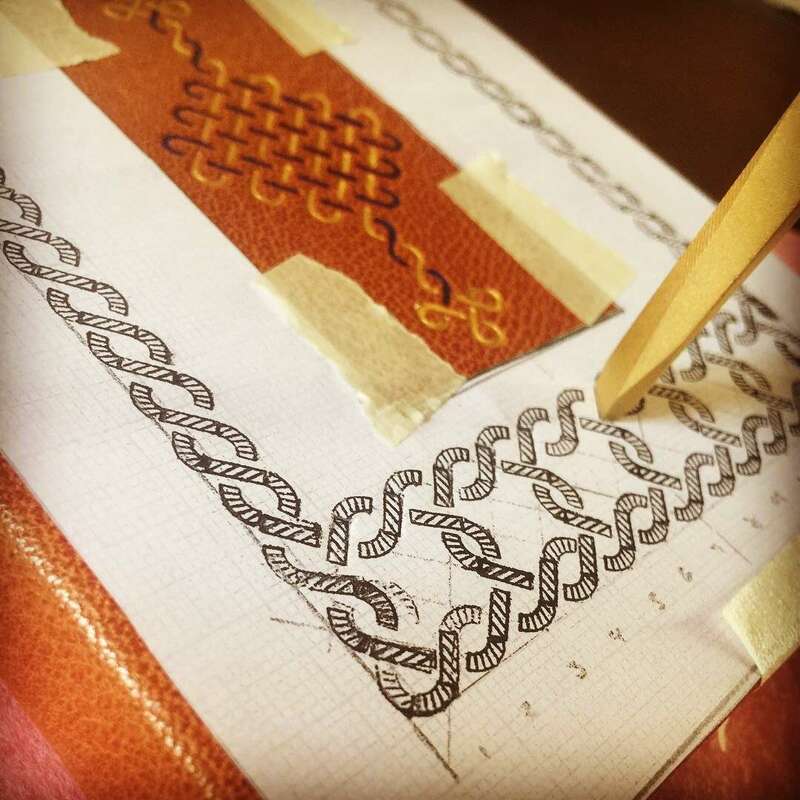 Leather, in the form of processed animal skin, often covers the wooden boards for the classic leather-bound book. Wooden covers are strong and protect the inner pages from inner damage. This one is hand decorated and joined to a leather spine. ANMM Collection 00054262. Hand painted detail on the cover this ships log. ANMM Collection 00054262. 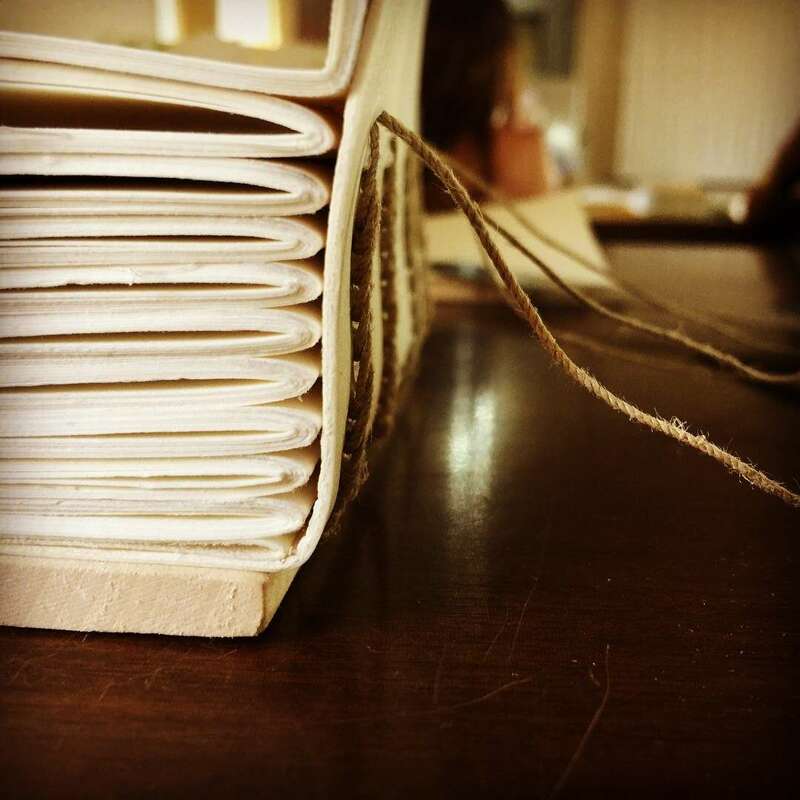 You can find out more about the structure and language of book bindings at the Ligatus Project Language of Bindings. 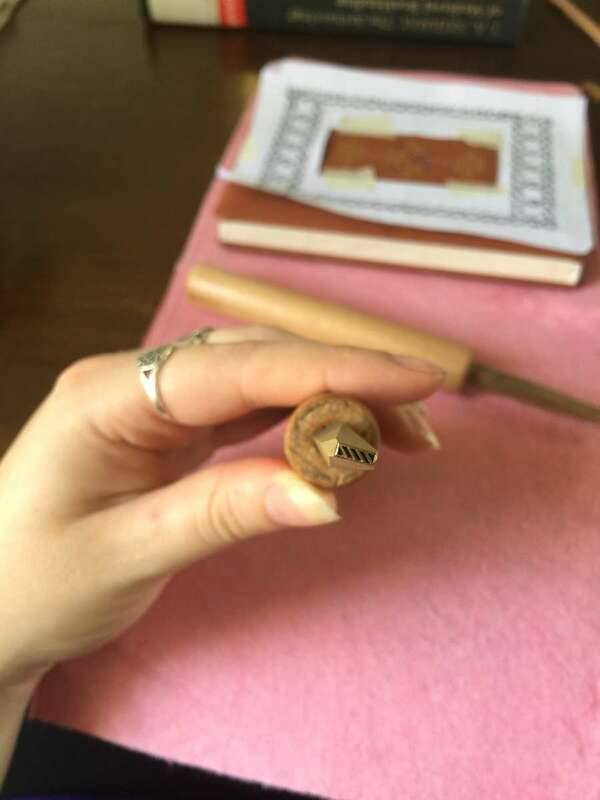 To learn more about how to protect, understand and treat the wonderful items in the collection, I travelled to Italy to find out more about the art of bookbinding and the skills needed for book conservation. Each year the Montefiascone Book Conservation Summer School is held in a small medieval town near Rome. 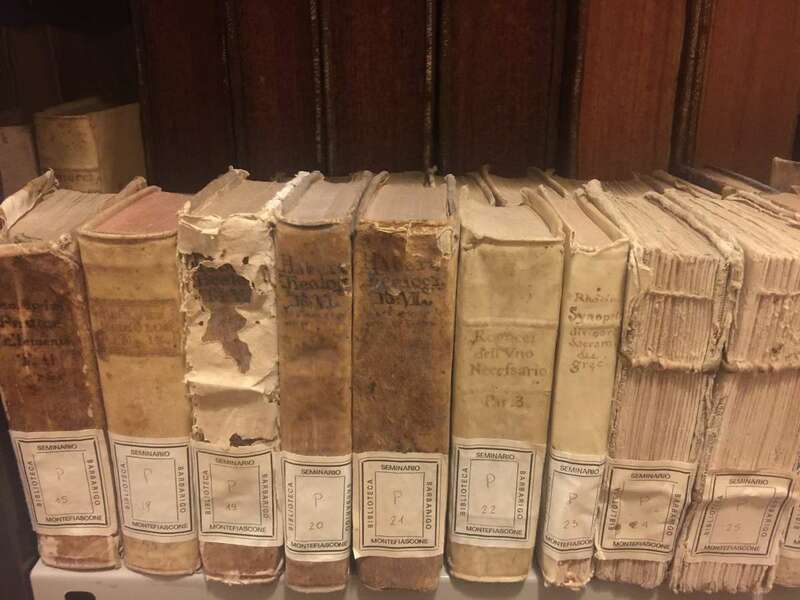 The School came into being during the 1980s, after Australian Cheryl Porter started a conservation project to preserve the crumbling medieval library collection of Cardinal Barbarigo, held by the Seminario Barbarigo and located in Montefisacone. The School is taught by world-leading experts and draws students from all over the globe. 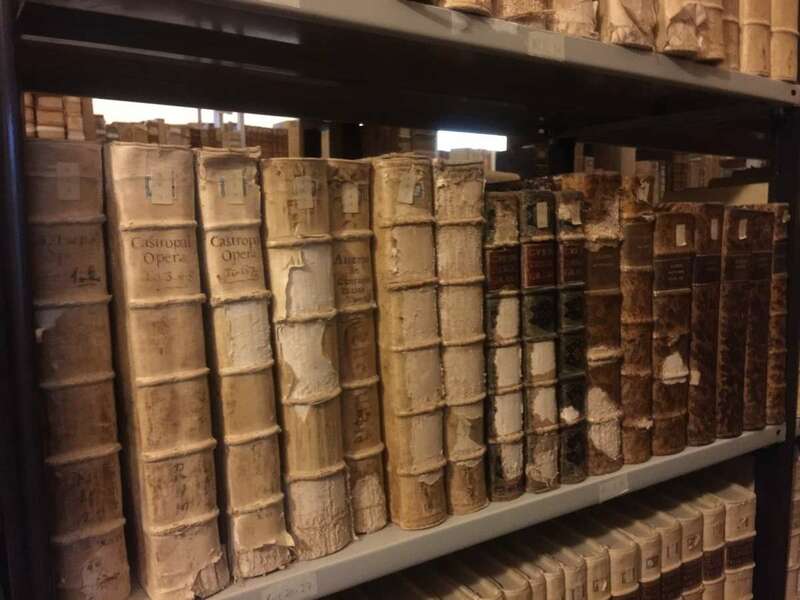 Some of the 5,000 bound volumes held in the Seminario Barbarigo Collection. Image: Lucilla Ronai. 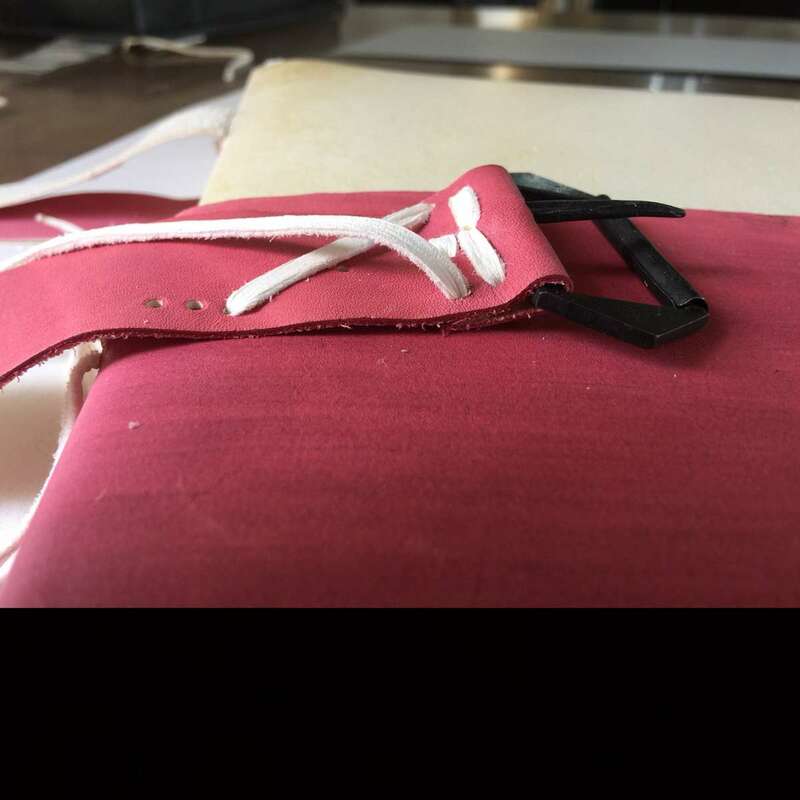 We learned to sew sections of a book together, stitch endbands, attach the books pages (known as a textblock) to wooden boards, dyed animal skin vivid colours using natural dyes, decorated the covers using pigments and metal tools, and created metal clasps to hold the book closed. We used traditional tools, innovative tools and sometimes, no tools at all. We got cuts and calluses on our hands. We sweated in the 40 °C summer heat, with no air conditioning. I had never been happier. Sewing an Ethiopian book together. Image: Lucilla Ronai. Coptic style endband sewn with linen thread. Image: Lucilla Ronai. Attaching 15th Century Italian binding textblock to shaped wooden covers. Image: Lucilla Ronai. 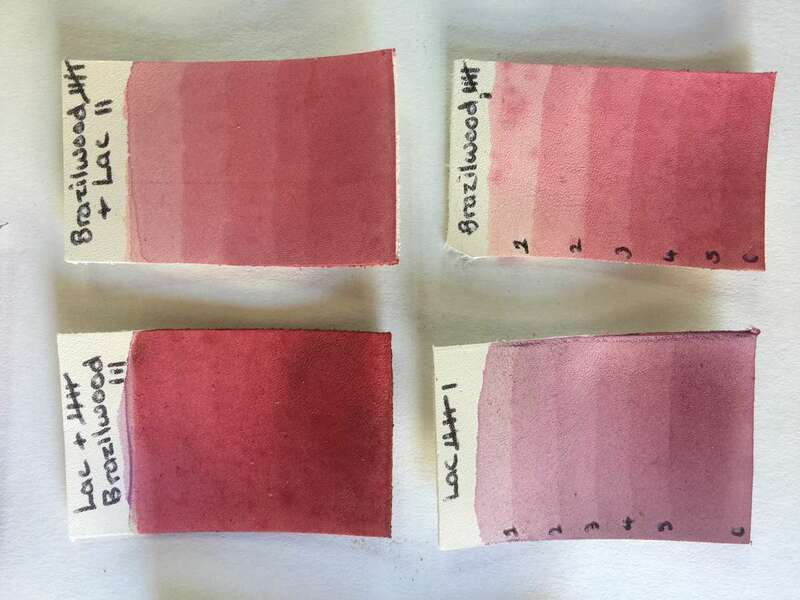 We used boiled brazilwood from trees and lac from insect excretions to dye animal skin varying shades of pink. Image: Lucilla Ronai. Hand stamping decorations on to leather cover and using lapis lazuli and gold pigments to add colour. Image: Lucilla Ronai. 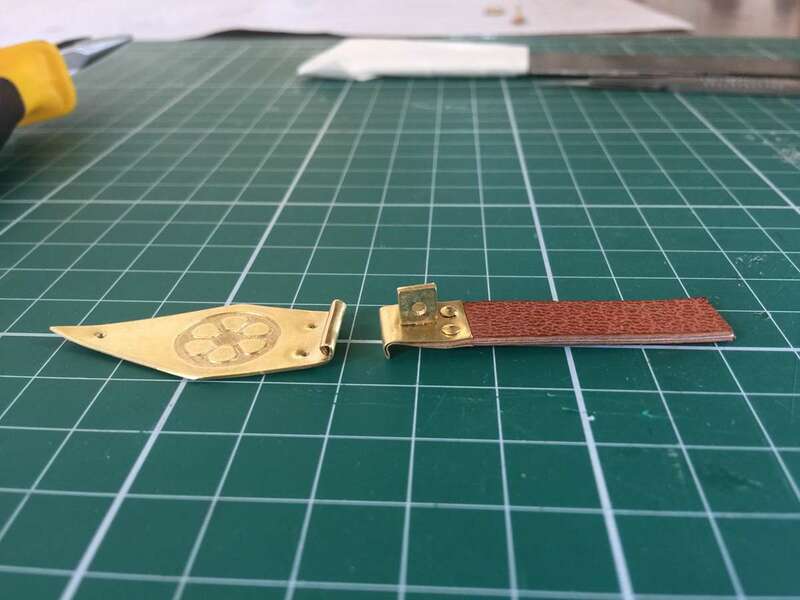 Creating a metal clasp from brass and leather by hand. Image: Lucilla Ronai. Conservators need to work with their hands, have incredible manual dexterity and focus. These skills were put to the test during the three weeks I spent at the School. I returned to the Museum, eager to share my new-found knowledge and put my skills into practice. Stay tuned for more adventures of a booklover! I would like to thank Conservation by Design for awarding me with the 2017 Nicholas Hadgraft Scholarship to attend the School. I would also like to thank the Montefiascone Conservation Project and the Australian National Maritime Museum, for their support to participate in this program.